Talking about dieting…. The vinegar dieting is back on demand! Heating up again gradually…. I am one of the followers on this diet. One of my dieting methods, now. I don’t think there are much scientific proof, besides having concrete findings that vinegar helps in body cleansing and detoxification (or similar effect). However, it does not equal to sure-successful weight lose effect. Only many (too many) hear-say that it helps a lot in slimming down, especially after the testimonial from one of the Japanese celebrity who lost 8kg in a month, many years ago. This vinegar diet has, then, become so popular and believing. As for me, I buy the idea, not only from the believing hear-say. I think the theory behind sounds logic, in my opinion. It makes sense to me that vinegar works for losing weight purpose. Well, I allow my intuition to guide me in my dieting program. How does it taste? Effective? It is very sourish. If drink without mixing with water or juice, it would be quite taxing for the throat and stomach. So, best to mix with water to drink up. Place Molasses sugar in a clean and completely dry glass jar. Add apple cider or rice vinegar and stir a little with a dry spoon. Need not to stir till sugar completely dissolved. Simply stir to dissolve slightly as the overnight placement will lead the job. Finally, add sliced banana. Close lid and leave it overnight before consuming. Direction: Take 1 tablespoon of vinegar and 1 banana slice before each meal. May take directly or mix in water or juice. For sensitive stomach, take only 10 minutes after each meal, instead. I read that the Molasses sugar is unprocessed and offers plenty of nutrients that benefit to our health. Vinegar cleanses body while taking the banana as well helps to block the absorption of carbohydrate from food taken. Tips: Use any fruit vinegar, distilled vinegar or rice vinegar. * Use medium ripe banana. 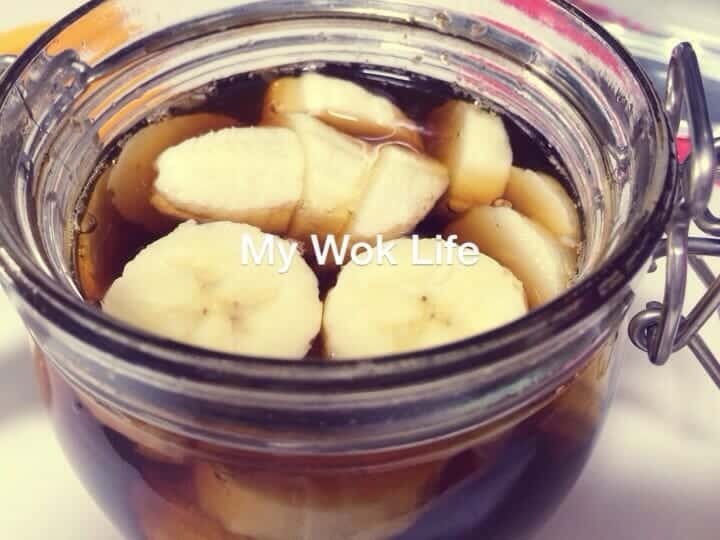 Banana will turn dark after soaking and it’s fine. * Use Molasses or red sugar is fine, but try to avoid white refined sugar which doesn’t offer any health benefit. Disclaimer: This is neither a medical research nor scientifically proven. Review was based on personal experience and opinion as well as online read-up. This post is meant for well sharing only. ***Take this drink at your discretion. No need. I did not when consumed within 2 weeks. Need replace banana after 2 week? Nope. You don’t replace banana. 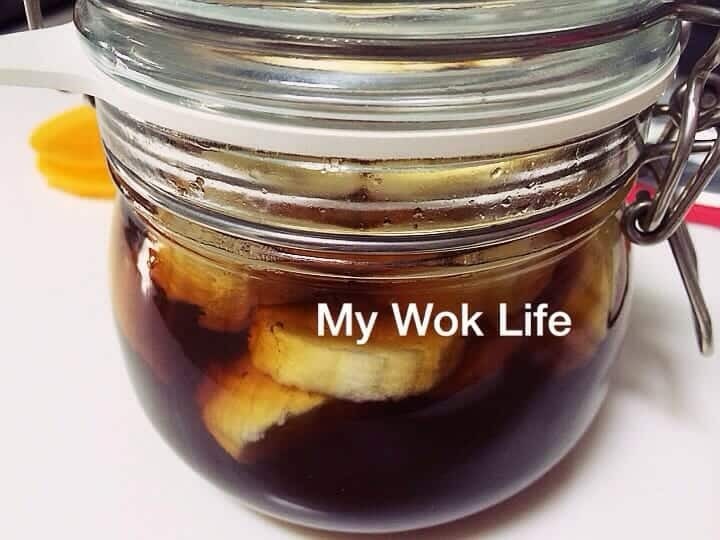 The amount of vinegar in my recipe should last you ard two weeks, together with the banana slices. I have tried for several weeks but my weight did not reduce …. why ? which part goes wrong ? :) This beverage is not a kind of slimming pill and it won’t work like it in anyway. It is the natural ingredients eg vinegar and banana which claim to help in weight loss by its natural substance. Also, by consuming this every morning, it supposed to help you to curb your appetite, and thus, to be able to resist extra portion of food which loads you with the extra calories. Hence, by eating lesser, it would help you to lose weight… As what I have mentioned in my post, I personally think that some exercises and diet conscious are still much needed to shed the extra weight.